We manufacture and supply digital oil bath. 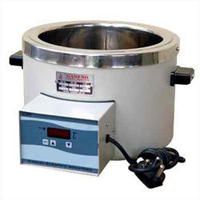 Double walled outer mild steel and stainless steel & Inner S.S.304 argon welded digital oil bath is supplied with thermostat. Temp. ranges from 50 ËšC to 300 ËšC Â± 5 ËšC. Equipment specially designed for tests in the field of Medical, Agricultural, Bio-chemical, R & D & Q.C Laboratories & to suit the various IS standards. Construction : Double walled, Exterior of CRCA/GI Epoxy Powder coated & Inner chamber of AISI S.S 304, with PUF insulation, S. S. Lid on top. Circulation : Efficient motor of 1440 RPM top mounted is installed for stirring to get temp uniformity. Heaters : S. S. tubular heaters for maintaining of temp. Refrigeration System : Hermitically sealed compressor provides temp. for below ambient conditions, Double stage compressors with cascade system for Temp. -40ÂºC / -70ÂºC, Refrigerant CFC Free. Temp. control : Digital temp controller housing all the controls, switches with PT-100 sensor. Option : Models available as per GMP/Complete S.S unit, Microprocessor based PID temp. control with printer interface, RS 232 CPC / RS 485 interface for multiple networking of controller. Validation : Validation Protocols for IQ OQ PQ & DQ complete documentation with reports, Calibration & Test Certificates traceable to national & International Standards. Safety Features : Safety thermostat for over shoot of temp., safety circuit to cut off the whole systems in case of malfunction. 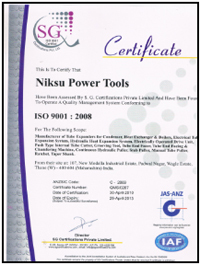 (Applicable to based models only) HRC fuses for compressors, heaters & mains, time delay circuit for safety of compressor. Special care : A suitable K. V. A. Servo Controlled Voltage Stabilizer is recommended.